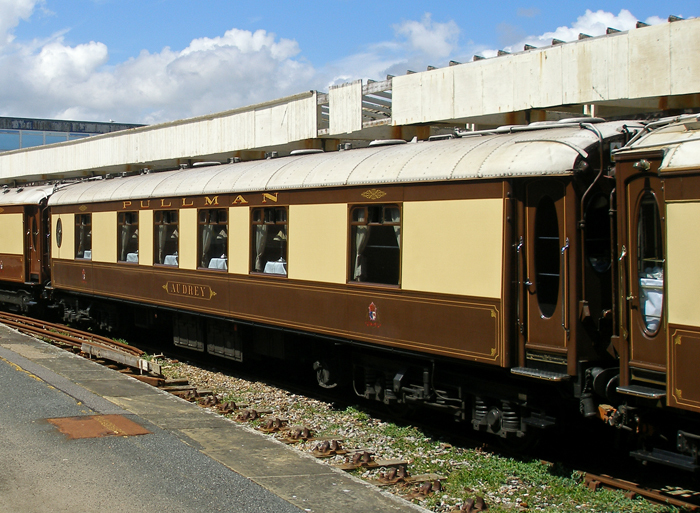 The origins of ‘’Audrey’’ are similar to those of ‘’Gwen’’, also part of the VSOE carriage fleet. It was one of thirty-eight Pullman vehicles, of all-steel construction, ordered by the Southern Railway for the Brighton Line electrification. All were built during 1932 by the Metropolitan-Cammell Carriage, Wagon & Finance Co. Ltd of Birmingham: fifteen were destined to be divided among three five-car all-Pullman electric multiple units; the remaining twenty-three vehicles were also intended to operate as part of EMU formations, albeit as single vehicles sandwiched in-between standard SR coaching stock. The full-accelerated electric timetable between London and Brighton was launched on New Year’s Day 1933, and concurrent with this was the launch of the electric ‘’Southern Belle’’ – ‘’Audrey’’ became part of 5-BEL unit No. 2052. This luxury service had begun life in 1908 as a steam-hauled affair, utilising a Marsh I1 4-4-2 Tank Engine (which had first been introduced during 1906), and timber-built Pullman cars. It was also during 1908 that the Metropolitan-Cammell C. W. & F Co. Ltd first began constructing Pullman vehicles, seven of these being completed in that year. Although the 5-BEL electric sets were the property of the Pullman Car Company, the SR was responsible for the maintenance of the eight BTH 225 HP traction motors and all onboard electrical equipment. Withdrawal of Pullman services occurred on the outbreak of war in September 1939, but many of these resumed in the following year, particularly those electric variants on the Central Section. On the night of 9th/10th October 1940, Victoria station’s ‘’Brighton’’ side was subject to a German air raid. At the time, 5-BEL unit No. 3052 was stabled empty stock alongside platform 17, and suffered considerable damage, being withdrawn from service immediately. From 22nd May 1942 onwards, Central Section electric Pullman services were withdrawn, and throughout the rest of World War II, 5-BEL No. 3052 was stored out of use at Crystal Palace High Level, in its bomb-damaged state. The ‘’Brighton Belle’’ service recommenced on 1st May 1946; prior to 1940, it was customary to have two of the three 5-BEL units in service at any one time, whilst the third was undergoing repair. In place of the bomb-damaged No. 3052, a 6-PUL unit was drafted in as a temporary measure – the former was dispatched to Metropolitan-Cammell for repair. Although Preston Park Works, Brighton, restored Pullman vehicles, it was already in the thick of repairing locomotive-hauled Pullmans that had also sustained damage during World War II. This extensive repair and restoration programme was shared between the Pullman Car Co. at Preston Park, and the original builders: Metropolitan-Cammell and the Birmingham Railway Carriage & Wagon Company. Unit No. 3052 was formally redeployed into service on 6th October 1947. Latterly, in 1955, all 5-BEL sets witnessed a complete replacement of their bogie sets, in an effort by the Pullman Car Co. to provide a smoother ride – there had been concern over the number of spillages over passengers when waiters were serving foot and drink! There had also been claims that the ageing bogies were causing excessive track wear. British Rail’s ‘’Modern Image’’ was officially launched in January 1965, and thereafter, a blue and grey paint scheme was applied to all ‘’main line’’ coaching stock. Applications of this livery to ‘’Brighton Belle’’ vehicles began nearly four years later, as the units were dispatched to Eastleigh for overhaul. 5-BEL No. 3052 was the first to be so treated, emerging from the South Western Division’s works in December 1968. The overhaul had resulted in the abandonment of the individual Pullman car names, vehicles now just being designated by their schedule numbers. ‘’Audrey’’ became No. S280S, and in place of its name was displayed ‘’BRIGHTON BELLE’’. The seats were recovered in the then prevailing ''InterCity 70'' moquette, but the rest of the internal decoration remained unchanged. The revitalising of the fleet did not, however, ensure longevity of the luxurious Victoria to Brighton one-hour-long service, and complete withdrawal of all 5-BEL units occurred on 30th April 1972. The redundant three-unit fleet was stored out of use in sidings at Brighton, and the formations were split up piecemeal, as single carriages were dispatched to individual private buyers. ‘’Audrey’’ was sent to the site of Ashford MPD in the year of its withdrawal, becoming part of an interesting array of stock held by the South Eastern Steam Centre. The carriage was purchased by the VSOE Company in 1980, and was taken by road to the 10,000 square foot workshop in Carnforth, for restoration. Now intended for locomotive haulage, rather than being part of an EMU formation, the carriage was completely rewired (as, indeed, were all the Pullman vehicles purchased for VSOE use). Furthermore, ''Audrey'' was fitted with a false underframe, so when in service, the carriage matched the height of its counterparts. The vehicle was ready in time for the first run of the revitalised VSOE from Victoria on 25th May 1982.